On May 2, Fiji was suspended from the Pacific Islands Forum (P.I.F.) for failing to come up with a roadmap for democratic elections. The deadline imposed by the Pacific Island leaders in Papua New Guinea on January 27 was lambasted by the Fiji government, which continued to emphasize that elections under the ousted 1997 Constitution will lead to a repeat of ethnic divisions. As witnessed in 2006, the Indo-Fijian and the indigenous Fijian communities rallied behind their communal constituencies to produce a racially polarized election result—an occurrence the government would like to see repeated. Besides communal cleavages, before the 2006 coup, the military and the elected nationalist government of Laisenia Qarase sparred over the government’s policies when it proposed pro-indigenous legislations, which were seen by the military as clear and present threat to national security. In December 2006, the military removed the Qarase Government from office in a bloodless military coup. Since then, the military commander, who championed a non-racial political model for Fiji, continued to support the 1997 Constitution despite challenges to the actions of the military in the Fiji courts by members of the deposed government. Supported by Australia and New Zealand, a number of pro-democracy coalitions sprang up in both Fiji and abroad, but by April 2009 the military government's support for the 1997 Constitution became untenable when the Fiji Court of Appeal adjudicated that the President of Fiji, Ratu Josefa Iloilo, had acted outside the constitution in dismissing the Qarase Government in January 2007. On Easter Friday, April 10, the 1997 Constitution was formally abrogated by the President of Fiji, and media were restricted from publishing materials detrimental to the regime. In light of these developments, Australia and New Zealand ramped up their rhetoric against the Fiji government and in particular against the interim Prime Minister and Commander of the Republic of the Fiji Military Forces Frank Bainimarama. The untenable position taken by Australia, New Zealand and other pro-democracy movements pushed Fiji to pursue stronger bilateral relations with China. Moreover, policy experts within Australia and New Zealand are now calling for a fresh approach based on re-engaging Fiji. On April 18, Jenny Hayward-Jones, the director for the Melanesia Program at the Lowy Institute in Sydney, noted that the Fiji crisis poses "a significant foreign policy challenge to the Rudd Government in the region… and that effective and inclusive leadership was required to address the situation." The Tongan Prime Minister Feleti Sevele, Anthony Bergin of the Australian Strategic Policy Institute, and the delegate of American Samoa in the United States House of Representatives Eni Faloeomavaega also called for a rethink on the Fiji issue. Faleomavaega requested that the United States "play a more proactive and independent role, one offering the country a better chance to emerge from the current crisis, eliminating its coup culture once and for all and establishing a more stable government." Smart sanctions against Fiji are currently imposed by Australia and New Zealand. Foreign Ministers of both countries have been actively lobbying the United Nations to suspend the use of Fiji troops in peacekeeping missions abroad. The New Zealand Minister for Foreign Affairs Murray McCully stated on April 21 that "it is very hard to see how [the U.N.] can justify using military people who have overthrown the rule of law in their own country as the agents to enforce the rule of law as peacekeepers somewhere else." The Prime Minister of Australia, Kevin Rudd, joined his counterparts in New Zealand in calling for Fiji's suspension from U.N. peacekeeping duties. However, the U.N. Dispatch observed that "Fijian peacekeepers haven't been deployed to new missions since the 2006 coup, and even under current policy, Fijian troops currently deployed—such as 500 in Iraq—will not be forced to leave. So it's unclear whether Rudd was articulating standing U.N. policy, or was calling for stricter measures against Fijian peacekeepers." Besides pressure on the United Nations, Australia has been pressuring the Chinese government to reduce its support for the Fiji Government. According to Phil Mercer of the Voice of America, "the concern among many in Australia is that China's apparent effort to use money as a persuasive diplomatic tool in the South Pacific undermines international efforts to isolate Fiji's military government." It is alleged that since Commander Frank Bainimarama's troops seized power in 2006, China's aid to Fiji has increased to $160 million. Worries about China getting a firmer foothold in the South Pacific via Fiji were also raised by the Canberra Times on April 19. An anonymous author highlighted that China was planning a significant expansion of its naval power in the South Pacific and that an isolated Fiji would be a tempting target if China should decide to challenge the influence of Australia and New Zealand in the region. China already has a strong presence in Fiji, and on May 21 the Navuso Bridge funded by the Chinese Government ($16 million) was opened by Vice President of Fiji Ratu Epeli Nailatikau. According to the Peoples' Daily Online, "the design of the 104.5 meters-long bridge was carried out by the First Highway Survey and Design Institute of China with construction carried out by China Railway Wuju Group." Relations between Fiji and China entered a new stage before the 2006 coup after the successful visit by Chinese Premier Wen Jiabao to Fiji in April 2006. During the visit, the leaders of the two countries decided to establish "China-Fiji important cooperative partnership" as a reward for Fiji's one-China policy. On June 2, a delegation of sixty Chinese entrepreneurs and government officials led by China’s Vice Minister for Commerce Jiang Zengwei held an economic and bilateral cooperation workshop in Fiji. 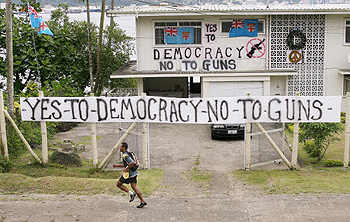 While Fiji and China have moved closer, a new group from Sydney called Fiji Democracy and Freedom Movement (F.D.F.M. ), formed on April 18, sent a petition to the Chinese mission in Canberra, requesting the country not to support the military government. The Movement wants Australia and New Zealand to impose trade sanctions, ban Air Pacific from flying to Australia, pressure the Australian government to suspend Fiji peacekeepers from the United Nations, and lobby the Trade and Business Council of Australia to force the Fiji government into a quick return to democracy. On May 24, a 150-member protest march was organized by the Movement at Hyde Park in Sydney, and the speakers included Parmod Rae, General Secretary of the National Federation Party; Ted Young, a former Minister in the Qarase government; and New Zealand-based businessman, Ballu Khan. In addition to this movement, a number of blog sites have become active in the past two years, but according to the Australian Associate Press, bloggers fear that they could become targets of the Fiji regime. There are also growing concerns among those opposed to the Fiji regime of recent moves by the government to regulate the legal profession in Fiji and ban the Methodist Annual Conference in August. On May 23, Radio New Zealand reported that the chief registrar of the newly decreed Legal Practices Board, Ana Rokomokoti, and men in plain clothes entered the Suva Office of the Fiji Law Society and took confidential files relating to complaints against Society members into custody. According to the report, the Society has been told by the Fiji government that it was taking over the organization's powers to issue lawyers' practicing certificates and deal with complaints. President of the New Zealand Law Society John Marshall stated in a press release, "The New Zealand Law Society is also very concerned about the process by which these and other wide ranging changes to the regulation of Fiji's legal profession have been made. There was no consultation, simply the issuing of the decree…. The regime arrived at the Fiji Law Society offices to remove files relating to complaints, which, under the decree, will now also be handled by the Registrar." Law Council of Australia Dr. Gordon Hughes also expressed concern that the Fiji government would deny the right of practice to certain lawyers. In months leading to the new decree on May 22, members of the Fiji Law Society had been openly criticizing the Fiji government, citing numerous instances of human rights and other constitutional breaches. However, the fears and concerns of the Law Society may be premature because all lawyers in the country will have to apply for new practicing certificates by June 30, and it is widely held that the Fiji Government will not be selective in issuing certificates as previously reported. The move by the Fiji Government was to investigate allegations of lawyers skimming trust funds for personal use. The Fiji Law Society has acknowledged in the past that the number of complaints about malpractice by lawyers has reached epidemic proportions. A number of prominent lawyers and members of the judiciary are not happy with the Fiji Law Society and the manner in which the international and regional organizations have responded to the move by the Fiji government to "clean-up" the profession. Some eminent judges and lawyers, who have taken up position in the judiciary despite warnings to the contrary from Australia, New Zealand and the International Bar Association (I.B.A. ), have criticized their compatriots for making a series of fundamental errors in assessing the Fiji situation, in particular on the threat to the rule of law in Fiji. On May 29, The Fiji Government refused the Methodist Church of Fiji a permit to hold its annual conference in August. The refusal came after growing concern among Fiji military that the church was a cover by hard-line indigenous nationalists to destabilize Fiji. Prominent among those within the church allegedly involved in organizing protests was Reverend Manasa Lasaro, a senior member of the Church who was involved in the destabilizing campaign against the Bavadra government in 1987 and was instrumental in providing support to the George Speight group in 2000. Reverend Lasaro said in an interview, "We reiterated the resolution made by the church's conference last year in relation to the military regime, that the church was opposed to the military regime in terms of oppression, in terms of intimidating people, in terms of detaining people and taking people up to the military camps and the police stations, and we were asking the military regime to consider the stand of the church in relation to bringing… democracy back into the country through general election." The Fiji Government believes that the pro-democracy rhetoric is a smokescreen to use the upcoming conference to instigate mass protests against the government. As a result of the ban, an emergency meeting was held between church leaders, President Ame Tugaue, General Secretary Reverend Tuikilakila Waqairatu Tuikilakila, and Prime Minister Frank Bainimarama. However, the Prime Minister remained unconvinced and requested that the church leadership remove political discussions from the church agenda altogether and sack Reverend Lasaro and Tomasi Kanailagi. Fiji military spokesperson Neumi Leweni explained that "church leaders have given no assurance they will remain silent on political issues." On June 5, the Standing Committee of the Methodist Church met and agreed to remove political issues from the conference agenda. In light of this development, Church leadership was hopeful that the Fiji Government would allow the conference to proceed. However, the issue of radicals within the church has remained unresolved. The moves by Australia and New Zealand to isolate Fiji have failed—in particular attempts at strangulating the economy by approaching the United Nations to suspend Fiji's peacekeepers and lobbying China to suspend ongoing aid and bilateral cooperation. The new Fiji Democracy and Freedom movement supports the actions of both Australia and New Zealand and have called for even tougher sanctions to force Fiji Government to hold elections as soon as possible. The problem remains that there is no constitution in Fiji following the abrogation of the 1997 Constitution. The Government of Fiji would like to see a non-ethnic electoral system in place, and Proportional Representation (P.R.) seems to be a likely successor to the Alternative Vote (A.V.) under the 1996 Electoral Act. While electoral reform is necessary, there will be moves to put together a new constitution, which will draw upon the work of the Reeves Commission Report, in particular on those parts that were not considered by the political leaders during their deliberation on the new constitution in 1996. A more interesting exercise would be the structure of the Senate. There are indications that Fiji will have an elected Senate and the voting age will be lowered to eighteen. The President of Fiji has indicated that 2014 will be the year when Fiji heads for democratic multiparty elections. In light of the changes proposed by the Peoples' Charter, Fiji's political parties will have to restructure and as far as possible develop multiracial policies. This is expected to be a break from the past communal-based electoral engineering and communal bloc voting that produced racially polarized results. There is a possibility that the President of Fiji could decree that political parties with communal agenda, be they Indo-Fijian or indigenous Fijian, are not allowed to register as a political party in Fiji. These issues should be considered by Australia, New Zealand and the various pro-democracy movements. There should be a global effort to support Fiji and assist the move towards a deliberative model of democracy that will allow inter-ethnic and intra-communal conflict to be resolved within a strong parliamentary system of government.